An annual art exhibition. 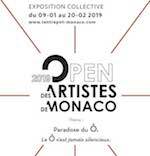 The theme of the 2019 edition of Monaco's Open des Artistes is "Paradoxe du O! Le O n'est jamais silencieux" (paradox of O! The O is never silent). Organized by Monaco Telecom and Daniel Boeri of Galerie l'Entrepot. For more information phone +377 93 50 13 14, visit Galerie l'Entrepot Mon-Fri, 15:00 to 19:00, and the gallery website at: Galerie l'Entrepot: Open des Artistes de Monaco.